Okay, this is not going to be the most glamourously illustrated post you ever see here at Hugs, but it does feature real live time capsule never-used vintage sheets, also known as giant pieces of unbroken cloth. And the packaging does feature some colour! 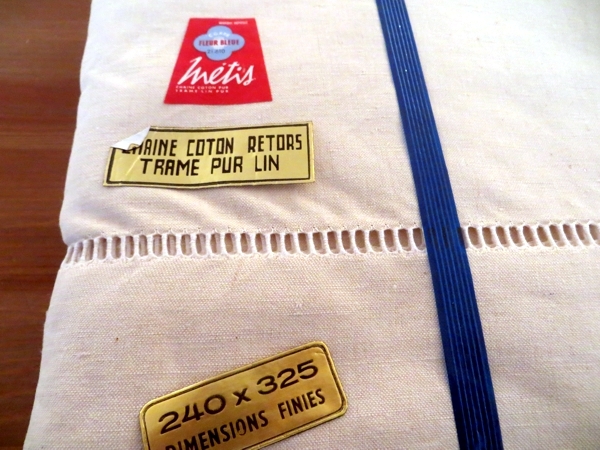 This is a still-packaged pair of new bed sheets from France, made from high quality linen/cotton metis, dating back as many years as it takes for the adhesive on the red 'Fleur Bleue' sticker to dry out and adhere near-permanently to the weave. The eBay shopkeeper who sold me these sheets had two sets, and I agonized about them for a while before deciding to buy only one, which was impractical because you know what? 100% linen sheets are really expensive. I've been researching a bit and there are only two or three sources for them (none of which are in Canada) that people who love linen sheets deem purchase-worthy. You're looking at more than a hundred dollars for even one sheet, for a small bed like a twin or a double. Vintage metis sheets, on the other hand, blend cotton with linen and cost less than half the price. Plus there is the element of 'earning their love' which creates a bond and also, an opportunity to use them for heavy drapes or upholstery. 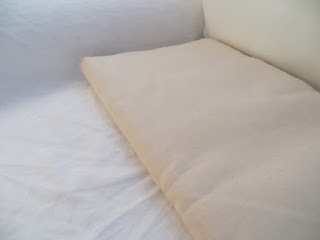 I'm talking about the fact that metis fabric is as stiff as a board when it's new, and a heavy flax colour to boot. Here's the new, never-washed metis lying on the much-used metis sheet I spent my summer airing out from its exposure to scented fabric softener, which lives on our white leather sofa to keep everybody from sliding off the darned thing because MAN leather seats are slippery. There's quite a colour difference, huh? Metis sheets get lighter after many many washes and sunny afternoons spent drying on a clothesline, so I expect these new guys will be cream coloured for some time. Which is okay. It wouldn't matter for my decorating purposes if they never lightened, because this colour goes very well with the backround of our drapery fabric. In fact if I didn't want to sleep on them, I could quite easily hand them over to our upholsterer to recover the sofa I have to keep in our bedroom since there's no other place for it, and the sofa would look gorgeous. But I do want to sleep on them, or at least, under one of them. 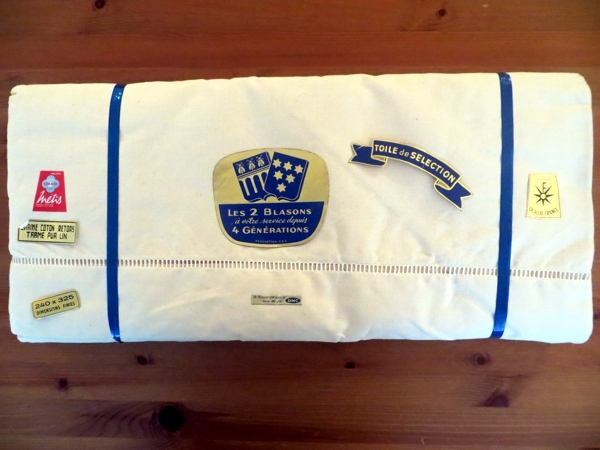 We've used cotton sheets for years and they are lovely, of course, not to mention readily available in discount department stores, and colourful and pretty. Mostly I'm just creating drama by thinking it would be fun to switch over to something new when we move back into our house. Except for this one small thing. Linen has this wonderful property when it comes to temperature control. I've noticed it with the linen clothing I've been buying more and more often the last couple of years - it's cool in summer, but it's warm in winter, too. Surprisingly warm and, because well-woven linen fabric is quite strong, it's long-lasting, so there's no end to the bliss. Aren't those pencil marks adorable? they washed out the first time they went through the machine. 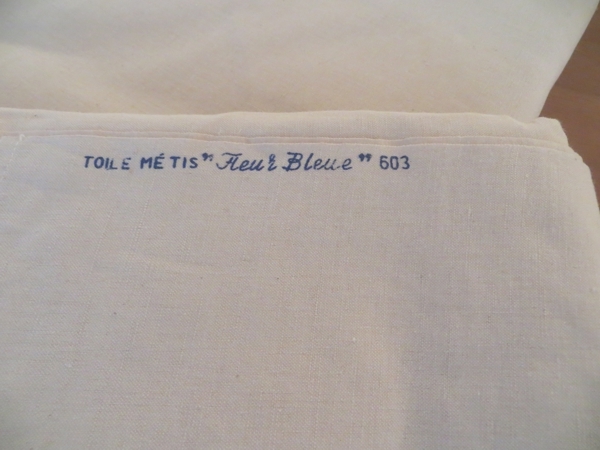 Even this blue ink noting that the fabric is top quality has washed almost all the way out, already. 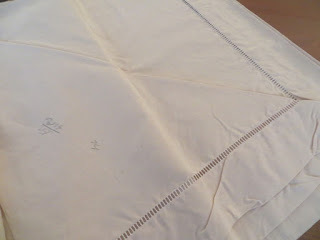 It turns out that the properties I admire about 100% linen are true even with these new metis sheets, now that they're soft enough to use. Yes, they still feel like somebody dragged a rough tarp over your shoulders, but they hold EXACTLY the right temperature. Since we've been trying these out, there's been no tossing off the blankets in the middle of the night, only to drag them back on again just before the alarm goes off. Which means no waking up two or three times every night, either. Maybe this is not a problem for you but wow, is it ever a big deal for us! So we love the vintage metis sheet idea, even if these giant flat pieces of fabric require hospital corners and are oddly shaped (very long and not very wide) and still quite stiff and not-white. After a couple of nights, even Pete wondered whether I might be planning to hunt for more and I was way ahead of him - I mean, how could I not click Buy It Now on a well-washed top sheet that's elaborately embroidered with an M and a P?